As a multi-cultural church NDFI equips parents to effectively train our children in the Christian faith as they do the common things of life. Faith is far more important than just two hours in the Worship Service. How does a parent take on the responsibility of "primary faith trainer" in the life of his growing child? Parents grow in their own relationship with Christ and understanding of the Bible. Parents learn how to effectively practice age-appropriate family devotions in their own home. Parents learn to equip their children for the natural, spiritual milestones of life. Deuteronomy 6, Psalm 78, and Ephesians 6:4 challenge the parents to take the spiritual training of their children very seriously. We equip our parents in a spiritual formation process that begins in infancy to adulthood fulfilling destiny and leaving a legacy of faith into the next generation designed around seven DESTINY MILESTONES. Where are Y-O-U? We value family and you can begin today by making a shift in your thinking and practice by getting equip through NDFI to disciple the next generation. 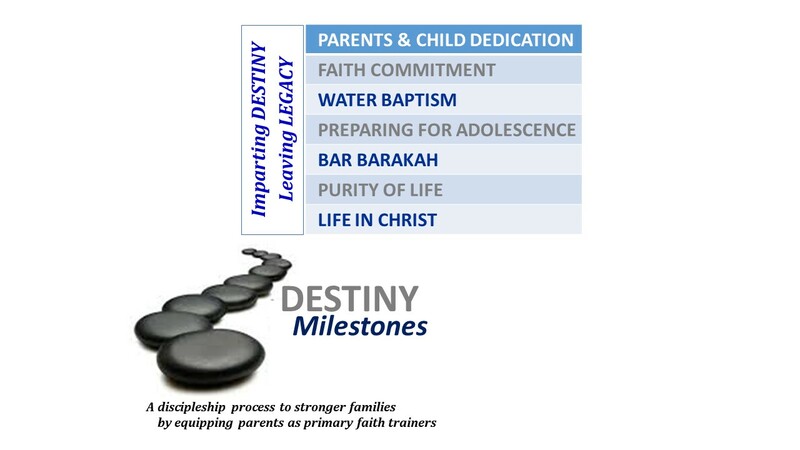 If you are interested to know more about the "7 Milestones" of our process in the DESTINY MILESTONES, feel free to contact us at: office@ndfi-church.org. Copyright © 2013 New Destiny Fellowship International. All right reserved.